When time-based control and energy consumption are a concern, the Elaho TimeClock brings low-cost, time-of-day control to Elaho power control systems. An intuitive six-button interface and large backlit display allow for simple set-it-and-forget-it operation, 365 days of the year. 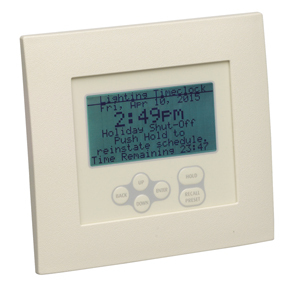 In addition to time based events, manual control via hold, override and event-recurrence modes, like “every day,” “weekday,” “weekend,” and “daily,” as well as fully-configurable Daylight Saving Time, holiday schedules, and special-event override make the TimeClock station adaptable to any application. The built-in FlickWarn feature gives occupants a visual signal that the lighting in their environment is about to change. Meeting ASHRAE-90.1 and Title 24 standards, the TimeClock maximizes energy efficiency by supporting astronomical, real-time and manual control events in up to 16 control spaces. The Elaho TimeClock connects to a control system using the two-wire, topology-free Elaho network and is available in cream, black and white.